Triathlon X (www.wasdalex.co.uk) is, perhaps, the world’s toughest ultra triathlon. That title hasn’t put off Christine Howard who raced (again) this year, and finished second (again). 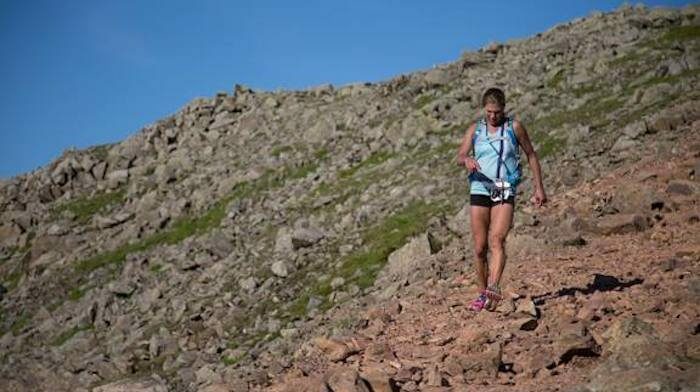 After we published the race winning report from men’s champion Steve Clark, recently, Christine got in touch to ask if she could also give her perspective through a female competitors eyes. Of course, we said yes! I took on Triathlon X (again), which I honestly think every athlete needs somewhere on their bucket list. I’m not generally the sort of person who makes a big deal of races, but Tri X really is something special and the more people who know about it the better. I’ve raced it twice now, both times leading the ladies race at certain points, then falling back to second and getting the Vets award instead and still find myself drawn back for more. This year was so hard but so beautiful, and shuffling in the final eight miles with my daughter Lizzie whilst the light faded over Scafell and we reflected on the events of the day, was something which will stay with me for ever. I did tell her not to let me do it again, but find myself already completing the early bird entry for next year. It was an awesome day out, with probably the friendliest, most supportive fellow competitors I’ve ever raced against. The conditions made it such that we were all in it together and the overall outcome was less important. One thing that did strike me was the total lack of women in the field. And only two of us finished the full course. Not quite the stats of a normal ironman race. Are the girls put off by the course description, 33% bike gradients, remote unsupported mountain run and tight time cut offs? These are of course all the things that made me want to do the race. I’m no bra-burning feminist, but I do think more women could be encouraged to have a go, they currently don’t know what they’re missing. It would be good for more than 1% of the starting field to be female next year. So the swim started early, 4.30am, in a rather cool Windermere. I ditched my watch before the start, it was currently sunrise and I needed to finish by sunset. Time checks in between would simply overcomplicate the final outcome. Swimming is not really my thing, something to be endured rather than embraced, but after the initial open water panic thing I found myself in a group of five guys who seemed to be swimming my pace so stuck with them like I’d known them forever. Getting out was a bit harder, 85 minutes at 15 degrees left my legs and brain somewhat numb and I stumbled rather than sprinted into T1. Looking around I could see several casualties of the cold who were being swaddled in foil blankets and fed hot drinks. Shivery cold myself, I got on with downing my Mountain Fuel Recovery and setting off up Kirkstone Pass. Anyone who has raced Helvellyn Tri will know how this pass feels on tired legs. Not so Tri X. I was super fresh and couldn’t wait to get going. Or get warm. A whole flock of sheep seemed to have escaped onto the road overnight and dodging around them took my hill climbing skills to a new level. Despite the early hour, spectators lined the top of the climb making it feel like the place to be at 6.30am on a Saturday morning. Nobody’s going to feel lonely on this race! After such a cold start, the day was heating up and by the time I’d reached the top of Honister Pass all memories of being so cold had melted away. Bunches of riders were forming in the way that happens on long sportives and I was soon able to mark my pace from a friendly Manchester rider whom I covertly named Mr Consistent. If I surged ahead he would soon catch up whist I took a breather. The more economical way of riding was simply to keep him in sight. Some people like their technology; watts, metres, GPS trackers, HR monitors, Garmins. I’m more at home with perceived http://healthsavy.com effort and looking around to see how the rest of the racers are getting on. After a drinks station at the top of Honister and more Mountain Fuel refuelling, it was time to tackle that big issue of downhill. As you go over the brow of Honister there’s that feeling of riding into nothingness. A void. But it is actually a really steep downhill punctuated with hairpins and the odd stray sheep. The sort of thing my Downhill MTB son gets high on. The sort of thing I lose sleep over. But I was ready this year. I had the bike with disc brakes. All was well. In fact after a shaky start I even went past a couple of guys who had jammed their brakes on even harder than me. That felt good. Maybe my recovery from a broken elbow and two lots of surgery last summer was complete. The roller coaster of passes and descents continued, punctuated by the lovely ladies at Whinlatter feed station doling out top quality assistance and Nicky Marshall and her mum popping up in all sorts of random places on the course to provide a two-strong cheerleading team much to the envy of my fellow riders. It was a ride without any big egos, all of us simply enjoying the scenery and the next climb challenge. Riders seemed keen to help other riders with inner tubes and tools when disaster struck, an altogether new concept in an ironman race. 30 miles to the finish. Who ever put that sign up had a sense of humour. We were now in the Eskdale Valley, home of The Ratty Railway and many happy childhood holiday memories. The drinks station was out of water, so instead of waiting for the next supply I filled a bottle up in the nearby toilets, got some of my Mountain Fuel home made banana gels down and headed for Hardknott. In the heat of the day this made sense. In hindsight it made no sense. The 30 miles which followed involved the most intensive climbs on the course and would require far more than a litre of fluid on such a hot day. Learning issues aside, the climbs were good. Most of the guys got stuck in and rode the 33% incline, I have a terror of being stuck in the pedals then falling onto my ruined elbow so made a decision to hike-a-bike the tough stuff. The outcome was virtually the same and descending Wrynose my thoughts began wandering to the run ahead. Firstly, I was hot and thirsty. Not a good start. Secondly, I was now the leading lady. Not something I’m used to on the bike phase. Being from a running background I’m used to working my way up from the back in a triathlon, so this felt a bit uncomfortable. 26 miles is a long way and Scafell is a high mountain. That’s a long time for things to change. The logical part of my brain was looking for a method to rectify the heat damage incurred on the bike and I contemplated a dip back in the lake at T2. Choosing to ditch this in favour of a faster transition was another decision I’d come to regret. Riding into Ambleside felt great, even more so because my parents and daughter were lined up along the road shouting their support. More Mountain Fuel and a change of kit and I was out onto the run. Well, almost out onto the run. Mum was shouting me back ‘Christine, you need a sun hat on!’ I declined the flowery wide brimmed affair she was offering and took Dads’ black cap, then set off again. So far so good. The encouragement from spectators out of Ambleside was immense and running made a nice change from riding. In the early stages the run is nice and shady, weaving along a river course, and I began to think I may have got away with insufficient hydration on the bike. Then the first stomach upset hit, not unusual in a race of this length. Followed by another. Still, I trotted on, walking the uphills, running the downhills and flat parts, encouraged by quite a few guys doing the same. 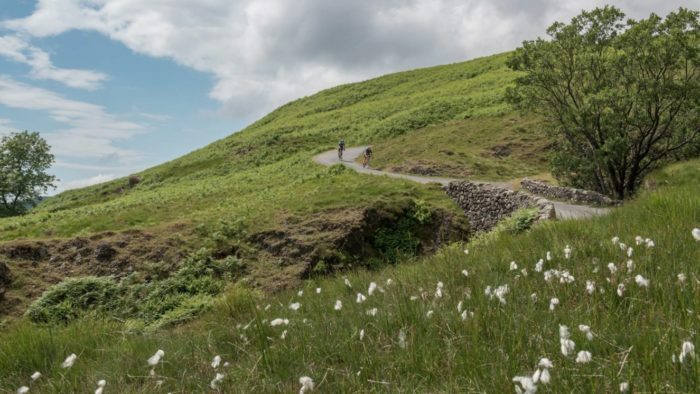 At Skelwith bridge I passed a few guys lying in the river moaning about the heat and terrain and I began to feel thankful I was still standing and moving forward. Next came the army of green clad Macmillan charity walkers pounding along the Cumbrian Way from Keswick to Ambleside. Clearly on a mission, they weren’t going to move from their three abreast formation to let a selection of tired triathletes through and I felt myself wasting loads of energy dodging round them. By now one of the relay ladies had caught up and we ran along chatting, getting to the Dungeon Ghyll feed station together. Far fresher than me, she was in-and-out in no time whilst I faffed around transferring a two litre fluid bladder into my run bag. And did I need this. There’s a flattish two mile trail in the sheltered valley basin prior to the main Scafell ascent. It was shimmering in the heat, oven-like for all us runners. Well, sort of runners. Walking seemed like a more viable option and would remain the case for the next few hours. Despite looking forward to the climb, hitting it felt horrible; not helped by a niggling hamstring cramp. Steve Clark came into view, romping down the mountain on his way to a race win. I shouted some encouragement and picked my own pace up a bit, feeling like I should be trying harder. Not too long later a few more downhill runners raced past then Jon Marshall, with new mum Nicky, (my cheerleading team from earlier), pacing him round the run. She looked amazing and was clearly enjoying her day out. We stopped briefly for a much needed encouraging hug then got going again, me upwards them downwards. How I wished I was them, on my way back in. At this stage my heart felt as though it was on the outside of my chest, pounding way too quickly for the speed I was going. Damage limitation came to mind and I knew it was time to eat and drink more and slow down even further, so when the next relay girl passed I didn’t even try to stick with her. Luckily she slowed down for me and shared a few Salt Stick tablets, I can’t thank her enough. This respect for fellow racers was happening all the way up the hillside and will remain a strong memory of the day. Along with Kate Morris at Angle tarn who is not known for being subtle with verbal support. And the guy on a weekend break from his engineering job in Dubai whose company I shared over the boulder field immediately prior to the Scafell Pike summit. Race aside, Scafell Pike didn’t disappoint. The heat of the day was over and all the surrounding peaks looked spectacular in the evening sunshine. This was definitely a view to be on top of. The Dubai guy got his picnic out and took a much needed ten minutes time out. Leaving him to his reflections, I headed off downhill and would soon meet Alison Bell on her way up. Too soon for my liking. She looked really strong and clearly had a lot of running left in her. No point worrying about that now, more immediate concern was the all on cramp in my left thigh, rendering it near useless on the downhill. This was supposed to be the good part of the race, the bit I’d cruise through overtaking people. Not so today. My hopping shuffle gradually picked up cadence and I picked up a few places on the steep descent, only to turn around near the bottom and see Alison come into view and then overtake me. So now I was second. Quite frankly, I didn’t care, I wasn’t even sure if I’d make the final eight miles in never mind keeping up with her. She also seemed really nice and wished me well for the rest of the run. I just had to somehow finish to pick up that 1st vet trophy. Things brightened up when my daughter Lizzie met me at Dungeon Ghyll for the final 8-mile run in. Something of a sunshine girl, Lizzie will always find fun in the weirdest of situations so we set out to enjoy the end of the day. Dressed in her Derbyshire Schools vest and racing flats, Garmin set and ready, she’d clearly been anticipating a faster finish. My walk / shuffle did achieve a few firsts for her, such as greatest daily step count, furthest milage run and latest time of day to be running. This seemed to satisfy her. And we talked to all of those left still standing in the race, less than half of the starting field, including an ultra-runner trying his first triathlon?! The light had faded, the day was gone, the finish was just around the corner. At last this long day was over, and what better way of spending midsummer than in the lakes on the hottest day of the year. I can’t start to describe the feeling of achievement from completing this event and want to thank all the people along the way who helped make such a great day, including Mark and the Tri X race team, Rupert from Mountain Fuel, all the other super friendly competitors, my parents for being in the right place at the right time, and of course Lizzie for being just the best company in the final stages of the race. Ladies, I hope you’ve now seen you don’t need to be the worlds’ best athlete to get his one done, and you don’t necessarily need all those triathlon add ons and technology to get round the course. It’s not impossible and it could be your race next summer too.